reykjavik is such an amazingly vibrant and interesting city, so i would wholeheartedly recommend spending a least a day exploring it before you move on. 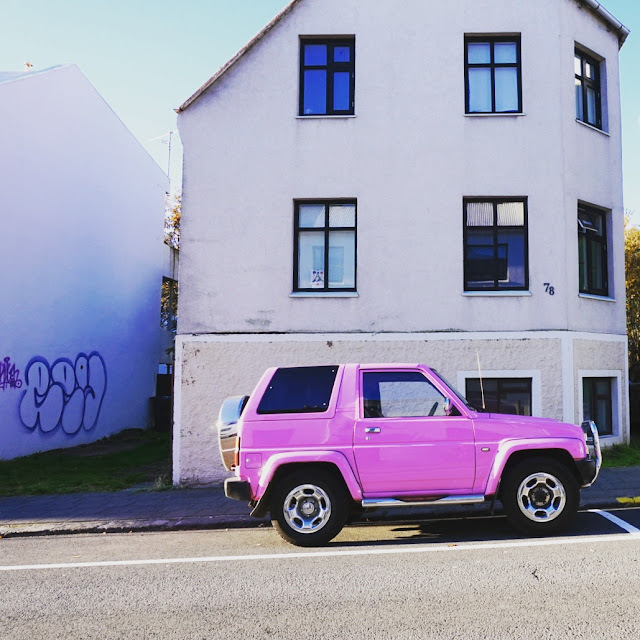 if you're interested in street art or urban culture or brightly coloured houses, then you will love reykjavik just as much as i did. we spent the best part of two days fulyl immersing ourselves in all the back streets and alleyways, getting lost on private roads and in school yards and church cemetaries, and i would certainly recommend you do the same. whether it's by foot or on two wheels (you can hire bikes there), there's so much to be seen in this wonderful nordic city, so definitely look into walking or bike tours of the city during your stay. everywhere we went, there were signs for whale or puffin watching tours. i don't personally like the idea of watching animals for entertainment, but i guess that in the wild this can sort of be overlooked a little; in truth: i personally find whale watching a little dull. i'm from a coastal city myself, so it's not like i've never seen whales in the wild before, and i saw puffins myself recently in ireland, so this is a tour we decided to skip. also knowing that whale and puffin are considered part of the food chain in iceland, i was a little put off by the idea, like - will we be hunting too? absurd, i know, but still. if you're there at the right time of year when the weather won't likely freeze you to death out on the open water, then getting in a boat like a real viking would be an amazing opportunity. i haven't really sold it though, have i.
if a bit of r and r is what you're after, then i have one suggestion: the blue lagoon. you might have read my post earlier in the week about how to prepare for your day there, which certainly came off a little negative. how odd for me, i know, but genuinely, i need to reiterate how incredible it can be if you're in the right frame of mind. 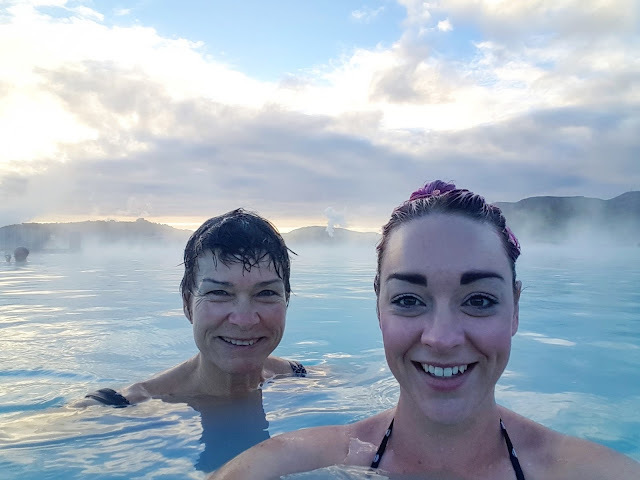 the milky, sulphur-filled water is so incredibly warm - and in places, quite hot, and being out in the freezing cold air yet so warm in the water, is such an amazing feeling. there are places to sit and relax, and a bar where you can get warm or alcoholic drinks to really help you chill, plus: mud masks. there's nothing an organic facial can't fix, am i right? oh my freaken god. when i was planning this trip, every piece of advice i read suggested the northern lights wouldn't really be visible at the time of year we went (late september). 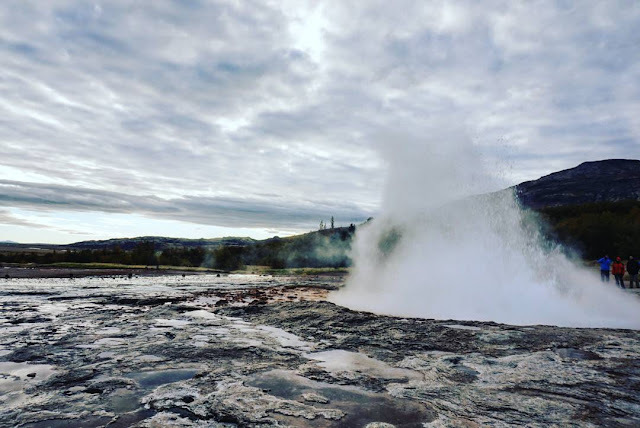 most of the dates suggest october to march is the best time of year to go, but when in iceland, you sort of have to go and give it a go, right? i wasn't sure it would happen, and so my expectations were low. but then we had amazingly clear days while we were there, and rumours were rife you could see the lights from the city itself in less light-polluted areas. so, we went. our tour took us about an hour out of the city, where we waited. and waited. and waited. and then... there they were. at first quite faint and white, and later more green and splashes of red and purple. dancing, across the blackened sky. you'll need a proper camera to capture the colours properly, but my goodness... that was something i'll never forget. where to even start with this one. from the golden circle where you'll take in such incredible views as the break between the eurasion and north american tectonic plates in pingvellir national park, to the gulfoss waterfall which has a natural staircase built into it and has the most romantic stories in its history, to the bubbling hot geysirs that erupt every few minutes, to the volcano craters, to the glacier, to the incredibly vast and unique landscape right across the country, there is literally natural wonder at every one of your finger tips. open your eyes and walk a foot and you will find it, and there are a zillion perfect day trips that you can take to behold them up close. i wish we had done one inside the volcano, as that looked incredible, as well as getting down into one of the craters. there were so many options and so little time, that we just couldn't get to it all. next time... definitely next time.